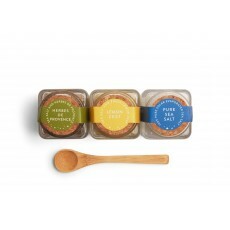 3-jar combination set consisting of 1-ounce jars of 100% Pure Amagansett Sea Salt, herbes de Provence salt, and lemon zest blended salt and the perfect bamboo Salt Spoon that fits our jars. These three salts are the go-to in our kitchen, so we packed them together for you. While we were at it, we threw in a bamboo spoon and knocked a few dollars off the price if purchased separately.